Maersk Just Set The World Record For Most Containers Loaded Onto A Ship | OhGizmo! In news only tangentially related to gadgets, the Danish shipping giant Maersk has recently announced that they’ve broken the world record by loading 17,603 containers onto their giant MV Mary Maersk ship. It is pictured here leaving the port of Algeciras, Spain, on July 21, 2014. That’s 17,603 TEU, to use the exact nomenclature, which means ‘twenty-foot equivalent units’, but you wouldn’t be too wrong thinking of them as containers. The ship itself is a mammoth “50 meters wide and 396 meters long. Its gross tonnage is 194,849, and according to MarineTraffic it is currently in the China Sea South traveling at a speed of 17.8 knots.” That’s a whole lot of goods making their way to us, and a good portion of them are probably consumer electronics. As a matter of fact, the ‘tangential’ reason we’re even mentioning this, aside from how impressive the feat is, is that most of our electronics are Made in China (or elsewhere), and bigger and more efficient ships can translate into a faster and more efficient supply line. That means less waiting for us Westerners, who are always looking to get our hands on the latest gadgets yesterday. 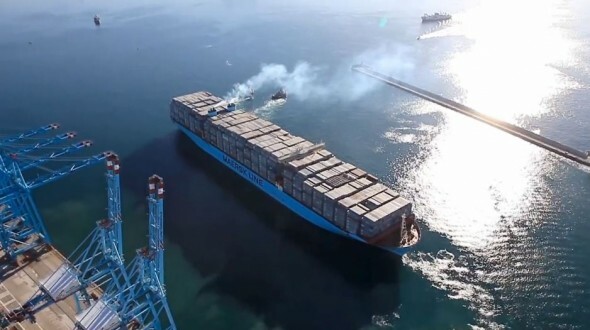 Mary Maersk leaves Algeciras from Maersk Line on Vimeo.